Author: Beatrix von Heyking. Series edited by: Norbert Cyffer, Osamu Hieda, Angelika Mietzner, Doris L. Payne, Anne Storch. 12 pp. Roman, 230 pp. The Boor are an ethnic group of estimated 8.000 people, distributed in the provinces of Bahr-el-Ghazal and Western Equatoria of South Sudan. Although the arrival of the Boor in the region is believed to have taken place only a rough 300 years ago, this area is perceived by all speakers as their traditional homeland. The Boor language is classified by Storch (2005) as a Nilo-Saharan language, which is further subclassified as Nilotic, Western-Nilotic, Northern-Lwoo. It is the smallest language of the subgroup and closely related to Shilluk, Anywa, Jur, Thuri, Päri and the Southern Lwoo languages. Due to its immense influence, the Ubangi language Belanda Bviri is of great importance to any study of Belanda Boor. The name Belanda Boor is a composition of the autonym Boor and the Central-Sudanic Bongo word beerlanda. 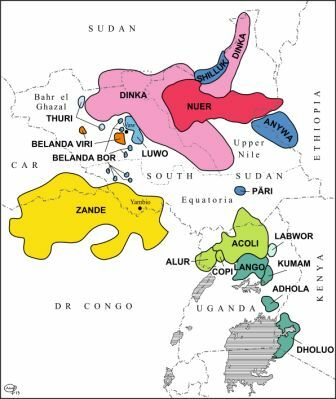 In Bongo, beer is the overall ethnonym for all their Lwoo speaking neighbours whereas landa means ‘hill, mountain’ the composite thus referring to the Lwoo of the hills, the hill dwellers. Today this rather descriptive Bongo name includes the genetically unrelated group of the Ubangian Bviri. The name therefore highlights one of the most defining aspects for both the language and the community of speak­ers: the close alliance with the Ubangian Bviri. The intriguing facts lie in the persisting bilingualism of the speakers and a conservation of the Lwoo lexicon while the grammar shows a progressing structural convergence. The incentives for a linguistic study of Belanda Boor chiefly originated from two aspects: first of all Boor was a nearly undocumented language and second it promised most interesting insights concerning the implications of language contact. The main basis for this work was provided by data gathered during two periods of intensive fieldwork conducted in Khartoum in 2007. The intention of this work is to provide a descriptive grammar in accordance with Basic Linguistic Theory. The realm of this volume is however restricted to the phonology and morphology of the language. Syntax and pragmatic are intended to be described in a following volume. Thus this study comprises first an over­view of the phonology of Boor dealing with the inventory of phonemes, the phonologic processes as well as the consideration of historic changes, and a second part dedicated to the morphology. This part is organ­ised in several chapters. Here the noun, the noun phrase and the pronominals are described. A further chapter is dedicated to the documentation of the verb and the verbal system. Concluding the description of the different word classes are two subsequent chapters on closed word classes and ideophones. Finally in form of a last chapter a conclusion is drawn. As a field linguist who benefits from documentation and analysis, I appreciate Heyking’s treatment of the grammar from a framework neutral perspective. She briefly refers to frameworks for assisting in the understanding of noun and verb semantics, but clearly explains other grammar directly. As a result, her data will be especially accessible to language developers and those who assist them. 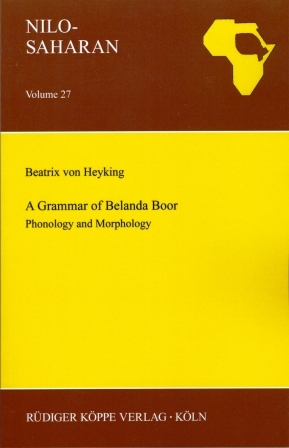 All in all, Heyking’s book is a major contribution to descriptive and comparative linguistics, in that she thoroughly documents the morphosyntax of the Belanda Boor language, and painstakingly compares the grammar with related Western Nilotic languages and unrelated Ubangi languages.